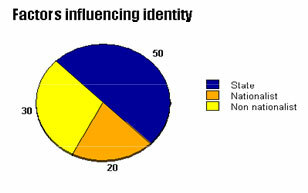 Assess the significance of state, national and non-national factors in defining your personal identity. Students explore the influence of nationalist loyalties on personal identity by assessing the significance of state, national and non-national affiliations in defining their personal identities and those of their classmates. a Haitian-born refugee is appointed Governor General. Encourage students to suggest other personal, local, national and international events that are sources of personal pride. Record all the suggested events on the board. To meet diverse learning needs, consider reducing the number of events. Invite students, individually, to identify the 10 events from the above list that are personally most significant. Ask students to consider events that provide them with the greatest attachment or allegiance or the greatest sense of pride. Direct students to record each of the 10 events on a cue card or sticky notes and to arrange them in order in a top 10 list. Next, organize students in groups to discuss which of the suggested events have the most significance for the group as a whole. If there is no consensus in the group on the 10 most significant events, encourage subgroups to assemble separate lists. Once the groups have identified their top 10 lists, encourage them to examine the most significant events that other groups have identified. Invite students to discuss the differences among the groups. state: a sovereign area in the world, often synonymous with country; e.g., Canada, Republic of Ireland. multination state: when a particular sovereign geographic area is occupied by more than one nation; e.g., Canada, United Kingdom. non-national focus—based on local connections, personal preferences. the significance that the events have for the individual in terms of personal allegiance or sense of pride. Ask students to assign an overall percentage of influence to each of the three categories of events (the total should be 100%). For example, students might decide that nationalist events represent approximately one-half (50%) of their mix of significant affiliations and the other two categories of events contribute equally (25% each). To help determine a percentage allocation, encourage students to use one of the charts in Rating Options (Support Material) to assess the impact of each top 10 event and tally the score for the three categories. Encourage students to prepare a visual representation of the relative significance of each of the three sources of their personal identity. Students might construct a pie chart illustrating the percentage allocation and prepare written responses to explain the reasons for their allocation. The following chart was prepared electronically using a program available from the National Centre for Educational Statistics (see References). To meet diverse learning needs, consider forgoing the written responses and have students provide an oral justification of their allocations. What differences do you notice in your identity mix and those of others in the class? What factors might explain these differences? What are the advantages and disadvantages of various emphases (e.g., What are the benefits and shortcomings of a population with a heavily state-focused identity?). Consider the advantages and disadvantages from the perspective of an ordinary citizen and as a leader of a country.